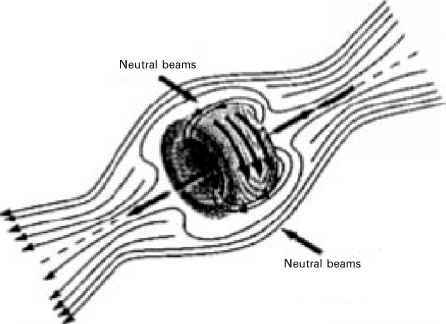 In a field-reversed mirror (Figure B.11) plasma confinement is achieved by producing a ring current of energetic particles (typically by external neutral beam injection). If the current in the ring is sufficiently large, field reversal occurs and a napkin ring-shaped configuration is produced with closed magnetic field lines confining the plasma. This concept was pioneered by the ASTRON device [Gormezano, 1979] where field reversal was attempted with a beam of particles characterized by orbit size comparable with device dimensions. The field-reversed mirror has a great deal in common with "compact tori'' configurations and therefore will be discussed later. (where vti is ion thermal velocity) which shows a much stronger dependence on mirror ratio than a conventional mirror. Furthermore, the confinement time depends on system size, unlike ordinary mirrors. Figure B.12. Layout of a gasdynamic mirror from [Nagornyj et al., 1984]: (a) magnetic field lines; (b) magnetic field strength on the axis. Bmax, B0, and Bab stand for the magnetic field value in the mirror, the solenoid, and the absorber; L, Lm, and Lex are the lengths of the solenoid, the mirror, and the expander, respectively; a is the plasma radius in the solenoid. (note the extra factor R). 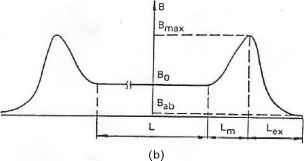 Therefore, short mean free path and high confinement require long configurations and a large mirror ratio. It can indeed be shown that for energy production using D-T reaction, the mirror length should be in the range of 10 km at plasma densities around 1021 m—3 and a mirror ratio of R = 50. Since the Lawson parameter is proportional to nL, shorter configurations can be achieved at a higher density. With a plasma radius of 0.1 m, such a device would produce fusion power in the range of a few tens of gigawatts. 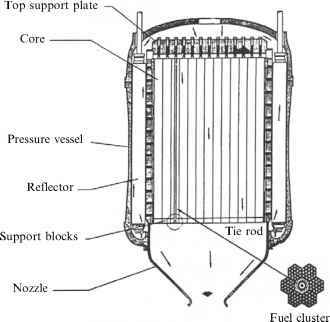 Neutron power density would be around 10MW/m2. Higher values of plasma density would reduce the size of the configuration but would also increase the neutron wall load above the limit at present considered realistic. At present, the only gasdynamic mirror in operation is at the Budker Institute in Novosibirsk [Kruglyakov et al., 2002]. It consists in a device with a mirror-to-mirror distance of 7 m, magnetic field up to 0.3 T in the midplane and up to 15 T at the mirror, with a radius at the midplane of 8 cm-15 cm. Oblique neutral beam injection at 15 keV is used for plasma heating up to 4 MW. Fast ions are reflected inside the mirror and density peaks in the outer part of the central cell, where fast-ion densities up to 1019m—3 have been measured. Target plasma density in the range 3-20 x 1019 m—3 have been produced at an electron temperature up to 130 eV. This device demonstrated that MHD plasma stability can be achieved in axially symmetric magnetic fields. Flute modes were stabilized by using external axisym-metric anchor cells in which the field line curvature was favorable for stability. As a result, on-axis fl values exceeding 40% were almost entirely associated with the fastion population. The gasdynamic mirror has also been proposed as a possible volumetric neutron source. When compared with fusion reactors and taking the central cell parameters, the present results need to be extrapolated by about a factor of 5 in p*, and 2.5 in m*, whereas the values of fl would be within 50% of those obtained in the present device. A second gasdynamic mirror experiment has recently been completed at the NASA Marshall Space Flight Center [Emrich, 2002] to investigate the stability limits of this configuration.